MAC infoshop opening this Saturday! Super exciting! 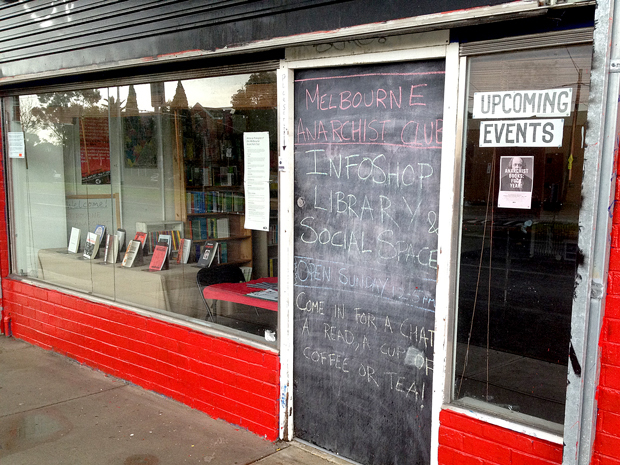 Melbourne’s only anarchist infoshop will be launching this Saturday evening from 7pm until late! See the MAC blog for more details. There’s also the Facebook event. The Melbourne Anarchist Bookfair has come and gone. There were many improvements on last year’s inaugural event; more space for workshops and talks, more talks. Below are links to some of the reviews, some of which have generated much discussion. The main controversies, if the pub talk was anything to go by, were the inclusion of the Communist League and Polyester Books as stall holders. A couple of particularly good replies to this review were in the comments of Kieran’s website. From Lia. From Rebecca. A Marxist goes to an Anarchist Bookfair. IWW Melbourne GMB: A Melbourne Wob reviews the 2nd annual Melbourne Anarchist Bookfair. Plan to Win’s recommendations for “good anarchist and activist books”. The Facebook event also has a lot of discussion. The next major event for the discussion of anarchist ideas looks to be the Anarchist Summer School up in Queensland in 2013. We have added Black Light #1, a publication of the Melbourne Anarchist Club, to our Anarchist Texts page. Check out the eye-popping cover after the break.